6 May 1941. We’ve arrived at last after months in Casablanca, which I once remembered fondly & now loathe. Sold all my good white linen bed sheets for Moslem shrouds to raise money for our sea passage. The Faithful must meet their Maker wrapt in the colour of purity, but I would’ve slept on straw, on mud, on a bed of nails to leave Africa. Every day we were in danger. Everyone knows B.B. supported the Loyalists in Spain & wrote editorials for La Revolution Surrealiste & corresponded with Trotsky, for godssake. Fascists in every bar & café. Nazis, too, now that Rommel has taken over the Occupation & his officers carouse their days away. The Soviets will make mincemeat of you within the year, B.B. told anyone who would listen. Didn’t care a fig who listened in. Every night I feared the knock on our door, which thankfully never came. As for our sea passage, I have little to record. I was sick, B.B. was sick. Everyone sick & absolutely grey with fear. We sailed on a Union Oil tanker, The Montebello. A favorite sport of Nazi U-boats, torpedoing a merchant ship with refugees aboard. No more than a rifle or two to defend us, should we be attacked. Every day the radio told of another sinking–in the Atlantic, in the Caribbean, & all hands lost. Nazi U-boats take no prisoners, save no survivors bobbing amongst the waves. I began to wonder what it must be like to drown. Your hair streaming up into sunlit waters, your feet plunging into blackness below. The fearsome struggle to breathe–would it be swift or slow? Would you notice fish? When would they start nibbling at the lobes of your ears? I had to set this journal aside. Force myself to stop conjuring up horrors. When we hobbled ashore at Tampico, I fell on my knees & kissed the beach. I mean literally. B.B. laughing & lurching about on his sea legs. I can still taste the sand on my lips. Filthy, but marvelous. The marvelous taste of our deliverance. Nothing but the shirts on our backs & two little bags between us. We haven’t got a penny. It’s completely true what Breton says of our destination. Mexico is the Surrealist place par excellence. The land blazes with a savage golden light. A tiger light. The jungle spreads its tendrils to the very edge of town & the leaves of certain palms possess a clarified green the like of which I’ve never seen in Britain nor in Europe, save perhaps Tuscany. Blossoms have their wanton way in every window box, on every street corner, through every crevice in the ancient stone walls. Brick & mortar are no match for the lusty thrust of Life. I love the lascivious pinks, the regal purples. I spied a scarlet that actually throbbed, as if the colour of blood was pulsing from a newly opened wound. The natives wear their modernity lightly. As if civilization is but a garment to be donned or disposed of at one’s will. I should like to feel that unencumbered of my past. Thanks to the small refugee stipend paid to us by the Mexican government, we have found an apartment on Gabino Barreda, near the Monument to the Revolution (B.B. likes that, a poetic touch). Three horrid little rooms in a decaying stucco tenement. Plaster crumbling off the walls, scorpions in the kitchen. Other vermin, too, I fear. Mother would faint dead away at the sight of the pit in the floor that passes for our indoor plumbing. There is an alcove off the bedroom, though, which has light nearly all day & a terrace overlooking the street, which is delightfully picturesque. B.B. says I may take it for my art studio. The landlady (upon whom B.B. has worked his usual masculine charms) came by with two white, blue-eyed kittens, brushstrokes of fawn on nose & paw. She says they are Sealpoint Siamese such as I have not seen since Mother’s house in London. Enchanting & I wept, realising how much I’ve left behind. How much the war has taken from us. The simple pleasure of kittens. How can I not be happy? The Sixty-third Anniversary of Hysteria was published in Full Spectrum 5 (Bantam), which included stories by Michael Bishop, Karen Joy Fowler, Jonathan Lethem, and Neal Stephenson. The anthology was edited by Jennifer Hershey, Tom Dupree, and Janna Silverstein. The Sixty-third Anniversary of Hysteria is on BarnesandNoble, US Kindle, Canada Kindle, UK Kindle, Apple, Kobo, and Smashwords. The Sixty-third Anniversary of Hysteria is also on Amazon.com in Australia, France, Germany, Italy, Spain, Brazil, Japan, Mexico, Netherlands, and India. The year is 1941, and Hitler’s armies are sweeping across Europe. Nora, a budding young Surrealist artist, has fled to Mexico with B.B., a much older and acclaimed Surrealist playwright down on his luck. Hundreds of European artists and writers have formed a colony in Mexico City, and Nora befriends Valencia, a fellow Surrealist artist and refugee. Together the friends explore Jungian psychology and the power of symbols in their extraordinary, visionary Art. Inspired by the lives and friendship of the brilliant Surrealist artists Remedios Varo and Leonora Carrington. A summary of the artists’ lives and a list of Sources follows the novelette. A summary of the artists’ lives and a list of Sources follows the novella. The Sixty-third Anniversary of Hysteria was published in Full Spectrum 5 (Bantam), which included stories by Michael Bishop, Karen Joy Fowler, Jonathan Lethem, and Neal Stephenson. If you’re a millennial, you may not realize just how bad American society was for women before, say, the 1970s and 1980s. Women struggled long and hard to win the vote and didn’t win that struggle until 1920—fully 144 years after this great country was founded. For many of those years, women could not sign contracts or take legal action without the permission of their husbands or fathers, were routinely denied gainful employment and access to higher education and the professions, and were generally denigrated and disrespected in society except in their role as submissive wives and mothers. This was especially true in the arts and literature. A woman like Edith Wharton—whose writing I revere—succeeded, but she was a very wealthy and socially prominent woman who was willing and able to fight. The same is true of Gertrude Atherton. In the arts, women were denied publicity, access to top galleries, and critical review that male artists took for granted. That’s why many of us are unfamiliar with the great women artists of history. The 1940s was a period when numerous women artists emerged, especially in the Surrealist movement. And that’s what The Sixty-third Anniversary of Hysteria is about. I was inspired by the lives and the friendship of the brilliant Surrealist artists Remedios Varo and Leonora Carrington, who are my favorite Surrealists and, in my opinion, were much more talented and visionary than the famous male artists of that period. So there you have it, my friends. The Sixty-third Anniversary of Hysteria was published in Full Spectrum 5 (Bantam), which included stories by Michael Bishop, Karen Joy Fowler, Jonathan Lethem, and Neal Stephenson. This is a short story, mind you, not a full-blown book. 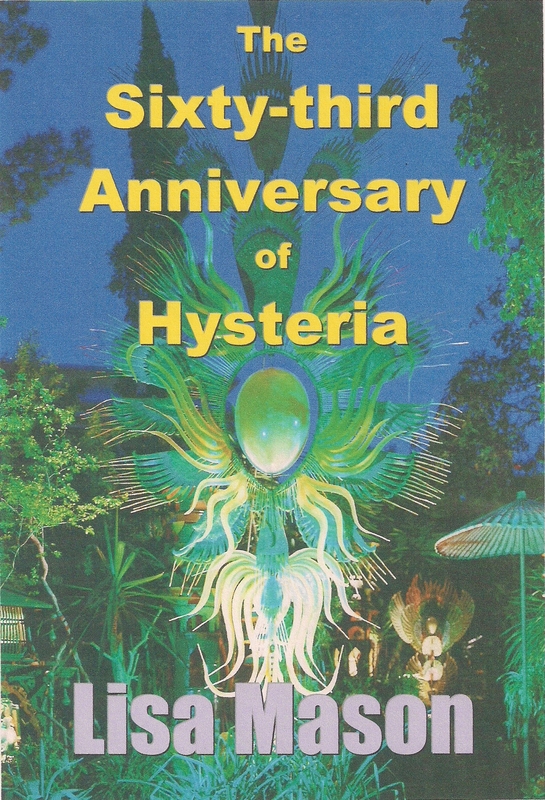 The Sixty-third Anniversary of Hysteria is also on Amazon.com in Australia, France, Germany, Italy, Netherlands, Mexico, Spain, Brazil, Japan, and India. If you’re a millennial, you may not realize just how bad American society was for women before, say, the 1970s and 1980s. Women struggled long and hard to win the vote and didn’t win that struggle until 1920—fully 144 years after this great country was founded. For many of those years, women could not sign contracts or take legal action without the permission of their husbands or fathers, were routinely denied gainful employment and access to higher education and the professions, and were generally denigrated and disrespected in society. This was especially true in the arts and literature. A woman like Edith Wharton—whose writing I revere—succeeded, but she was a very wealthy and socially prominent woman. The same is true of Gertrude Atherton. In the arts, women were denied the publicity, access to top galleries, and critical review that male artists took for granted. That’s why many of us are unfamiliar with the great women artists of history. The 1940s was a period when numerous women artists emerged, especially in the Surrealist movement. The Sixty-third Anniversary of Hysteria was published in Full Spectrum 5 (Bantam), which included stories by Michael Bishop, Karen Joy Fowler, Jonathan Lethem, and Neal Stephenson. This is a short story, mind you, not a full-blown book. The Sixty-third Anniversary of Hysteria is also on Amazon.com in France, Germany, Italy, Spain, Brazil, Japan, and India.